Representative Feighan did not initially endorse H.R.2580 and was close to organizations such as the American Legion and the American Coalition of Patriotic Societies that resisted immigration reform. Feighan opposed several provisions of H.R. 2580 and on February 20, 1965, prior to holding subcommittee hearings, he held a public hearing in his district that included parts of Cleveland, Ohio and surrounding suburbs. The questionnaire shown here was one of 33 filled out and returned at the hearing. 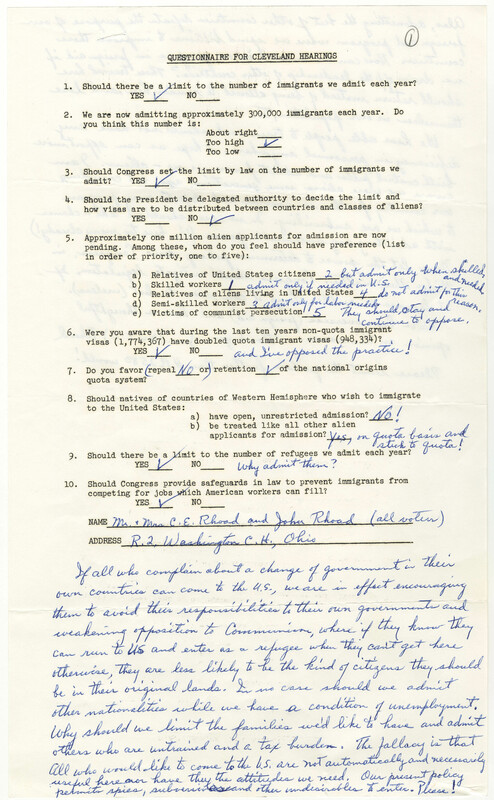 Only one of the returned questionnaires supported immigration reform. Chairman Cellar and Feighan had publicly feuded over immigration reform and on June 1, the Ohio representative introduced his own immigration bill. United States. Congress. House. Committee on the Judiciary. "Questionnaire for Cleveland Public Hearings on H.R. 2580." Questionnaire for Cleveland Public Hearings on H.R. 2580, February 20, 1965; “H.R. 2580 Questionnaires—Returned 7 of 8 folders” folder, Legislative Files, Box 77; Committee on the Judiciary; 89th Congress; U.S. House of Representatives, RG 233; National Archives.. Accessed 21 April 2019. http://acsc.lib.udel.edu/items/show/305. Questionnaire for Cleveland Public Hearings on H.R. 2580, February 20, 1965; “H.R. 2580 Questionnaires—Returned 7 of 8 folders” folder, Legislative Files, Box 77; Committee on the Judiciary; 89th Congress; U.S. House of Representatives, RG 233; National Archives.